A native of Los Angeles's Watts District, the distinguished actor Paul Winfield's earliest theatre experience came while he was a student at Manual Arts High School. He continued his studies as a scholarship student at the University of Portland, Stanford University, Los Angeles City College and UCLA. Mr. Winfield has gone on to amass an impressive number of television, theatre and film credits. Television audiences are perhaps most familar with Mr. Winfield's portrayal of Professor Huegly in Roots II, for which he received an Emmy nomination for "Best Supporting Actor"; and the six-hour special on the life of Dr. Martin Luther King, Jr., King, for which he was nominated for an Emmy as "Best Actor." 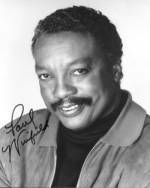 Paul Winfield has been seen in numerous films including Presumed Innocent; Mike's Murder; Terminator; Star Trek II; and Sounder, for which he garnered an Academy Award nomination for "Best Actor." Mr. Winfield performed the world premiere performances of Ghost In Machine by Frank Proto and John Chenault during the Cincinnati Symphony's centennial season, 1995. Mr. Winfield has been honored for his civic and artistic contributions from organizations such as CORE, Black Publishers of America, National Association of Media Women, California Federation of Black Leadership, and the NAACP, which cited him with its Image Award for "Best Actor."